GPIB cables consist of 24 twisted pairs of copper wire and utilize a Centronics 24 style male/female connector. •How are GPIB cables used? They are used in a bus or star architecture where the connectors "piggy back" each other and then connect primarily test and measurement equipment to PCs and other devices. •Where are GPIB cable used? 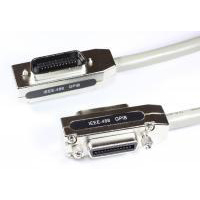 GPIB cables are typically used in test and measurement applications and are also used in DAQ(data acquistion) applications. HPIB: Hewlett Packard Interface Bus. Common name for IEEE-488. GPIB: General Purpose Interface Bus. Common name for IEEE-488. Mating connector for GPIB cable.